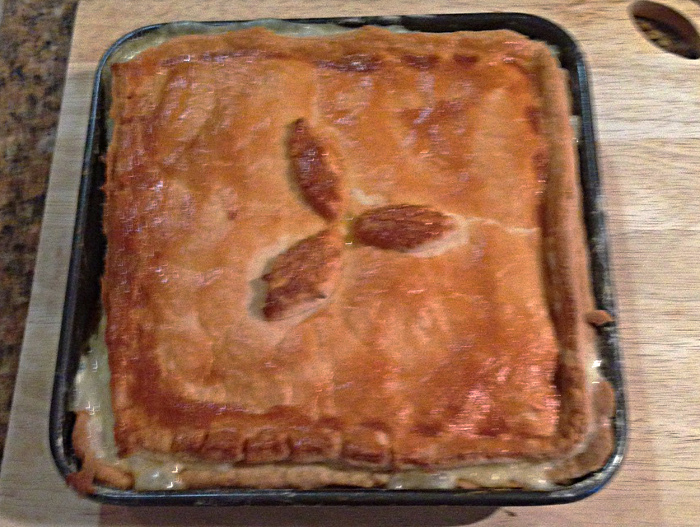 This is one of Nick's specialties, a rich and creamy chicken pie, just in time for those cold winter months. Before getting started poach all the chicken breasts in a pan of 450ml simmering water, add the chicken stock cube to the pan and leave for 10 minutes. Once done save 250ml of the cooking liquor to help make the sauce. Melt 25g of the butter into a large non-stick saucepan over a low heat. Stir in the already sliced leeks and fry gently for 2 minutes, until softened. Add the garlic to the pan and cook for a further 1 minute, then tip everything into a bowl. Return the pan to the heat and add in the remaining butter, stir in the flour as soon as the butter has melted and cook for 30 seconds – stir constantly. Then gradually add the milk – stirring well, once all the milk has been added gradually add the 250ml of cooking liquor and 2-3 tablespoons of wine (add more if you’re an alcoholic). Keep stirring and the sauce will become smooth and thick, season to taste and remove from heat. Once removed from the heat add in the cream and stir. Afterwards pour into another bowl and cover in cling film. If you’re feeling adventurous you can make your own pastry but if, like me, you want to cheat just buy 500g packet of ready made short crust pastry. Preheat the oven to 200°C and put a baking tin approx. 7-8 inch into the oven. Roll out the pastry until it is large enough to cover your baking tin, place the pastry into the base of the baking tin and blind bake it for 20 minutes. 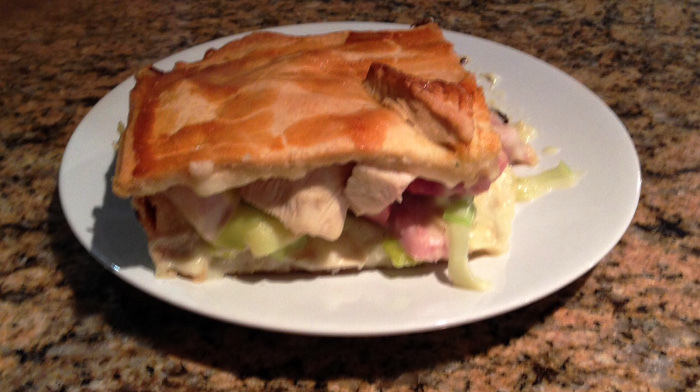 Cut the poached chicken breasts into 3cm chunks and add to the sauce along with the ham and leeks, give it a quick stir. Tip the filling into the pie dish. Roll out the rest of the pastry to cover the pie, press the edges together, trim and crimp. Make a small hole in the top of the pie and brush the top with the beaten egg. Place in the oven for 35 minutes until golden brown.